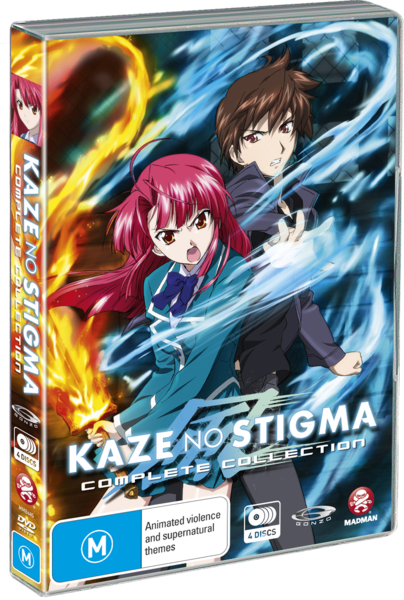 Spanning 4 discs and 24 episodes, Kaze No Stigmata the Complete Series is an exhilarating tale of murder, mystery and how to fit into one's family when you are very different. The world of Kaze no Stigmata is different from ours, with certain people able to wield the power of the elements as they wish. The more powerful the family of element users, the higher their status is in society. The pecking order of each family is determined by the young having to duel each other using the family element, with the loser of a bout being evicted from the their family. It's certainly a lot to take in and as long as you can forget the lack of morals in this practise, then the rest of the story falls into place and makes sense. The hero of the story is young Kazuma who is exiled from his family when he fights for right of succession within the family with his second cousin Ayano. The element that the Kannagi family use is fire and Kazuma is simply no match for the younger Ayano and forced to leave in disgrace. The years pass with no sign of Kazuma and the family business continues as normal until a string of Kannagi family murders see the return of the young man, whom the family suspect as being behind the killings. Kazuma has changed a lot in the time he has been gone and has also developed an ability to control wind and all things that go with this powerful element. The Kannagi family, bent on revenge attempt to do away with the innocent Kazuma, not believing his protests. Eventually he does regain their trust to an extent and meets Ayano who bested him during the family duels. What follows at this point is a team up between the two and a Kazuma's brother named Ren. They are determined to solve the mystery of the murders and explore the potential of fire and wind working together on a common goal. The plot does take some twists and turns at this point, and multiple leaps of faith are also required to make it through the series. The show, and remember we are reviewing a complete 24 episode series here, does follow the formula of that format so we are following multiple villians almost on a show by show basis which can be a tad confusing but at the same time within it's context, adds layers to the story. This is a storyline that could have been made a lot tighter and completed in less episodes. Whilst it is a good way to learn more about just what Kazuma can do with wind, it drags out certain sequences for a bit longer than they comfortably should have been. The first dozen episodes in particular seem to make Kazuma too powerful against all foes, so there was no real sense of danger when you saw him in combat. That's balanced a bit more in the latter half of the series, whilst fights involving Ayano and Ren do contain the potential for bad things to happen to them. The video quality is not bad on this series with strong vibrant colours used to good effect. The illustrations are heavily stylised with mainly strong base type colours used with little to no gradients. I'm not sure if the source contained this element, but the image is a tad grainy at times, not to the total detriment of the video but still affecting my score. Some of the animation came across as a tad choppy during certain sequences, but once again certainly nothing to be too upset about. I am a strong believer in the story should be carrying most of the total score, not technicalities. Audio is good on this production with crisp clear tracks in both English and Japanese. I usually prefer listening to the language the production was initially made in, however on this release I found the English dub to give a lot more to the story than the subtitles did, and finished the story with English audio. which did'nt really flesh out the main title at all. They are however fun 10 minute clips that show our three main characters via a clips done to look like they are on a promotional tour. The animation has been done to take on the appearance of a home video. Kaze No Stigmata is a good series with lots of potential. Whilst there was a lot of room for this to be a great tale as opposed to a good one, this was not followed up. I would still happily recommend the series as worth watching with good battles and colourful characters. If you are particularly fussy with your anime then you might wish to rent it out first before committing your hard earned coin. If you just want a fun ride though, here are 600 minutes for you!